Southampton’s spectacular run of form continued with a brilliant 3-1 win over Wolves, who appeared to be suffering from their FA Cup heartbreak, with goals from Nathan Redmond (2) and Shane Long enough to ensure all three points remained on the south coast. The performance was the latest in a sequence of stellar showings from the Saints, who now look certain to avoid relegation despite the dire mess they were in when Ralph Hasenhuttl took over before Christmas. One man certainly won’t be pleased with his efforts considering the extremely high standards he sets for himself these days. Pierre-Emile Hojbjerg is just one of many beneficiaries from Hasenhuttl’s arrival at St Mary’s Stadium, with the Dane having been handed the armband on a permanent basis by the former RB Leipzig boss having previously deputised as captain for Ryan Bertrand while the left-back was injured. “I don’t do very much, but what I do has to be the best possible. Indeed, the former Bayern Munich man has hardly put a foot wrong in 2019, although he will have been highly frustrated with his sloppy display in the middle of the park on Saturday. 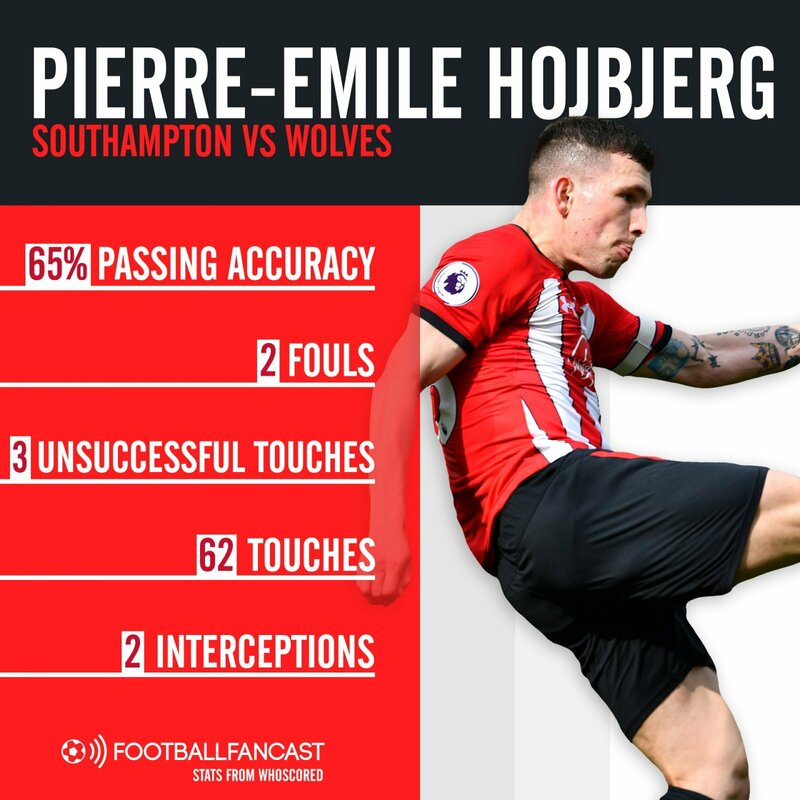 Usually a reliable distributor of the ball, Hojbjerg was well below his 83% passing success average for the season, registering 65% accuracy against Nuno Espirito Santo’s side, and also took a team-high three unsuccessful touches. Regardless, he was always on the ball and looking to be involved, with 62 touches to his name, but he was uncharacteristically wasteful on Saturday and, on another day, that could cost his team. There is no doubt that the number 23 will be keen to get back to his best when the Saints travel north to face Newcastle this weekend.